Game design student Kelli Dunlap is doing engagement outreach for a video game that could impact the 2016 election. "Games are often talked about in terms of the entertainment they provide or the cutting-edge technology they feature, but they can be much more than bits of code and shiny graphics," says American University student Kelli Dunlap. "Games create a space where players can push boundaries, devise clever solutions, and play with information in a purposeful way." For Dunlap, games are a great tool to get different audiences involved. She is the social media and community manager for Swing Voter Go, a game created for MoveOn.org by renowned game designer Jane McGonigal. 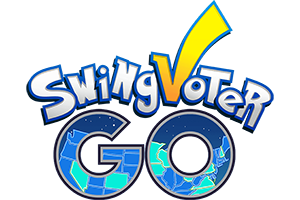 The goal is for players to nudge swing voters into Hillary Clinton's camp, although technically the game can be played by anyone to either candidate's benefit. Dunlap's current job, which includes playtesting, refining game flow, and social media management, may surprise some, given that she received her doctorate in clinical psychology. But it's her passion for psychology that actually led her to American University's game design master's program. "When you bring people together from markedly different backgrounds, you set yourself up to create something unique, innovative, and potentially world-changing, Dunlap explains. "These kinds of pairings are the norm in games as games are inherently multidisciplinary. To create a game, you need coders, artists, musicians, organizers, task-masters, and UX/UI designers. Today's larger game companies also employ psychologists, economists, architects, and persons from other unexpected professions," she says. Games are not just child's play anymore. They are changing the way we receive information and process ourselves. Dunlap knows the power that the gaming industry is starting to harness. "Games are not magic. They are not going to solve every problem or single-handedly bring about world peace. That said, well-designed games can be incredibly powerful at prompting behavioral change. There's an entire game genre known as 'social impact games' or 'games for change' trying to make the world a better place one game at a time," she explains. Games can help in more ways than one, whether you are trying to build memory capacity, learn a language or lose weight, games and innovative technology are changing our daily lives. Dunlap agrees. "For example, games have been shown to increase treatment adherence in pediatric cancer patients, reduce depression and anxiety, increase healthy behaviors, and reduce falling accidents in the elderly," she adds. You can follow Dunlap on twitter @KelliNDunlap. Get more information about the AU game design program.